Hello Verve fans! It’s time to party with Day 2 of the sneak peeks! I’m sure you’ll be lovin’ this new set called Party Time. I know I do. I immediately thought of this paper that I had from Basic Grey with the balloons and numbers on it when I saw this set. I couldn’t wait to pair the balloon image up with it. I stamped it three times, colored all the balloons with my Copics, and then cut them out. (Yes, I left the little white spaces between the strings because I’m terrible at using an X-acto knife! So it’s ok if you do the same! I hereby give you permission!) I put the card together and at the last minute decided to tie the little twine strings onto the balloon strings. Anyway, I hope you like what you’ve seen so far…there’s lots more to come! 1. Be sure you head over to the Verve Blog each day this week for your chance to win the set previewed each day by leaving comments on their corresponding posts. 2. My Give-away game is going on now in the SCS Forum HERE for your chance at winning $25 in Verve Bucks. More chances and fun can be found HERE. 3. There's still time to create your sketch cards for your chance to win more Verve stamps HERE. SUSIE Q-TIP: A little dab of glue behind the twine balloon strings keeps the bows from coming undone. Is it just me, or does that string just not make tight knots? I swear those balloons look real you did such a wonderful job colouring them. That card is gorgous. SHUT UP!!!! This is awesome, Susan!!! Oh wow!!! This is gorgeous!!! I love everything about this!! Oh my, this is gorgeous Susie! Love the depth of color! Just a terrific piece of eye candy. I may have to get my hands on that stamp set. love this card, SO darn cute! susan...this is fantastic, lady! 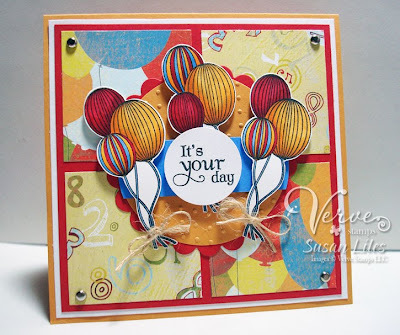 i love the bright and cheerful colors, and especially love how you bunched several balloons together...amazing job! susan...this is fabulous! i love the bright and cheerful colors of the dp, and love how you've grouped several balloons together...great job! This is gorgeous!!! I love it!! Now that is what I call bright and cheery! Great card! wow! This is fabulous! I love the colors, the paper, and the layers of balloons. It really makes a statement. Susie! The colors you used here on the balloons really make them POP! I love the color combos and its put together so nicely...puuuuuurty! This card is PERFECTION!!! The twine addition on the image is great!! I really love this set. Looking forward to see the others. These balloons are outta this world, Susan! What a truly stunning card! Gorgeous Susan!! LOVE all your balloons!! And the dp you used as a backdrop is fabulous!! Darling card!! Hi Susan. This card is AWESOME!! What a bunch o' work you put into this! Well... the outcome was worth it!!! Love, love this card! So bright & happy!